G Data Internet Security 2010, from G DATA Software AG, is a powerful security suite that combines antivirus, firewall, antiphising, antispam and child-protection into a single package. Blocks banners, pop-ups, Flash, Java / VB script, etc. G DATA Internet Security 2010 normally costs $29.95 per single license PC. As part of G DATA/Komputer Swiat promotion (limited time only), interested users now can get a 180 days license serial key for G DATA Internet Security 2010 for free, So hurry! Visit promotion page at http://gdata.pl/gdis6mcy/. Complete the registration form by filling in email address, CAPTCHA code and submit. An e-mail from “Klucz z G Data Software”, which attached with a PDF file will be sent to registered email shortly. 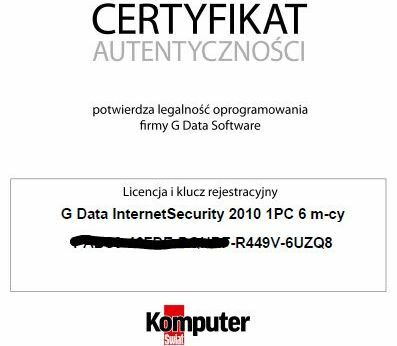 Open the GDataCertyfikat.pdf to check your free 6 month license key for G DATA Internet Security 2010. 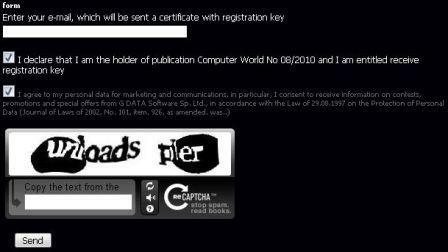 Input the received free 180 day registration license key code to unlock and activate full version product of G DATA Internet Security 2010. G DATA Internet Security 2010 is fully compatible with Windows Vista, XP and Windows 7 operating systems. Also available for free is G Data AntiVirus 2010 free 6 months license or more free anti-virus products available.